tabs, auto comments, more. Free pgm. The latest version of the extened TED, assembly-language editor. AE.COM: A .ASM file editor. intended for creation and maintainance of assembly language source files. not guaranteed to do anything except occupy 0 or more bytes of disk space. are NOT guaranteed to hold your hardware, software, or data safe from harm. to that set forth in this document, but there are NO GUARANTEES! can use this program in the submarine fleet. (Yea, right!). WordStar and WS are trademarks of WordStar International. a SI of about 1.1 or 1.2 - every bit helps. The requirement of a '286 or above should lock out anyone from running DOS 1.x. o 80286 coded for speed/compactness. o Edit files up to 64K in length. o Uses TRUE TABS for ease of use, and compact file size. o Enter key is always a cursor motion key. o Emulates most applicable WordStar commands. o Uses cursor keys for DOS weenies. o User configurable initial insert state. o User configurable backspace key - distructive or non-distructive. o Smart, column oriented cursor. o Intelegent use of EOF. o Automaticly inserts semi-colon at beginning of comment field if none there. o Automaticly appends colons on labels. o Automaticly strips trailing spaces/tabs. o Automaticly tabs from operand field to comment field. o On screen status line can be turned off, if desired. o User specified default file extension. o Pleasant audible feedback can be turned off if needed. Mark D. Pickerill, a professional assembly language programmer. many years. AE minimizes my need to use it. important, the source was in assembly. configurablity, this editor was created by me, for me, for my coding style. Naturally, I think my coding style is the best, but others may not agree. my assembly source files to be pleasing to the eye, and very well documented. Nobody's source code meets my documentation standards - including mine! AE is oriented towards a person who is used to, and prefers WordStar keystrokes. arrow keys, etc., but the program remains heavily WordStar-ish. As with all my works, AE is dedicated to my patron deity, the Goddess Athena. a semi-colon is inserted, so the programmer can immediately type his comment. tabbing in full line comments without conflict. comment column, and 2) has no existing semi-colon. A) Blank lines in source code (semi-colon present for consistancy). B) The programmer isn't going to comment this line right now. (tsk-tsk!) but the semi-colon remains for consistancy and style. In all cases the semi-colon is inserted at the specified comment column. instructions, DB strings, etc. ), no semi colon is placed. in all uncommented lines, vastly simplifying the commenting process. use the shift keys and/or re-engage the caps lock normally as needed. regardless of whether the FORM7 filter is selected or not. it turned off as MASM dis-allows colons on labels on EQU's, etc. after the label in this circumstance. for ASM programming. Like many other features, it is user configurable. the current line for another label or full line comment. instruction or to insert a label or full line comment. have if the last line isn't terminated. FIND/FIND NEXT: Unlike WordStar, FIND always starts at the top of the file. to be case sensitive. Any key other than defaults to case insensitive. Search and Replace: This function also always starts at the top of the file. This is ALWAYS a global search and replace, the most-often-used. doing its job - unlike WordStar which shows every single replacement done. as 4 or 10 are not supported. MODEM links faster, and most importantly ASSEMBLES FASTER!! If insert status is on, a tab is inserted. any characters that are there. Just functions as a cursor move key. of line, a tab is appended to the end of the line. writing assembly code which is TAB oriented anyway. by automaticly tabbing from the operand field to the configured comment column. inserted, etc, if AE is configured this way. This is automaticly turned off if the cursor is past an existing semi colon. can be configured to turn OFF insert. distructive backspaces. Therefore it can be configured as you like it. the 2500 A.D. assembler allows this, although it carries it a bit farther. filter will key off of it. in a label to mean something special, there is a config byte to turn this off. * as the first character of a LABEL. seldom wider than 80 chars anyway, but the capability is there, if needed. within the last 3 minutes. the shell to MS-DOS feature. The safety reasons for this are obvious. Auto-save is transparent to the user. The file is saved to .$$$. auto-save. This file may be re-named as needed. Auto-save will NOT kick in if the program is left waiting for user input. beeped once to call your attention to the attempt. line off, but you pick up an extra line of display. same. Regardless, I've always liked that feature and sorely missed it. it with a trailing dot, i.e. FILENAME. when configuring, it will effectivly turn this feature off. of either the TAB key or , or both. to go back and delete this space manualy. This is due to AE making the assumption that a semi-colon means a comment. I can't remember the last time I had a semi-colon in a quoted string anyway. A work-around is to DB 3BH or just toggle the caps lock as needed. the semi-colon manualy, and handle the formatting of the comment manualy. or use one of the control keys. (or turn this feature off). not function if there is a defined block visable *anywhere* in the file. "mask and compensate" that must be performed for the case insensitive search. exiting. Some keyboards also allow the state of the LED to be "fixed". follow the caps lock state. 2, below, and most other implemented commands fit this description. 3 (in the default configuration), and 6, fit this description. to mind. Nice feature when you need it, but you seldom do. Most WordStar keys are catagory 1 implementations. tab stop. Felt to be good enough for programming. 2) To the best of my knowledge, AE handles tabs just like WS. configuration does not. See above. a filename or utilized in a SAVE AS: mode. beginning of the line (beginning of the TAB). way was the beginning of the author's desire for a better editor! to DOS and you can do anything you like. 9) ^B doesn't just strip the high bit from the current line as WS does. It strips the high bit from the entire file. EOF checking is turned off). Not recommended, so do this at your own risk! to impossible to use weenie keys for everything without resorting to a menu. Some weenie keys may not make much sense and be hard to remember, esp. oriented towards folks used to WordStar (for better or worse). ^K0 - ^K9Place marker 0 - 9.
file if no block marked. characters that convert into nulls also are re-converted to SPACE. recommended settings, following these will result in an "out of the box"
copy of AE.COM. These settings are felt to be suitable for most folks. as it is felt that most folks won't want/need to change them. The following items can be patched in the .COM file with DEBUG. All values are hex unless noted. saving, stop at the first EOF when loading. do not append when saving. 0107FFFF=Auto comment feature. Insert semicolons. 010A FF FF for auto colons, 00 for no auto-colons. 010D 00FF to allow to generate new line with insert on. users can leave this on. LAME is turned on. (010D=FF) See note (3) below. 0110FFFF to enable 3 minute auto-save feature. If this byte is 00, AE will use the existing attribute. 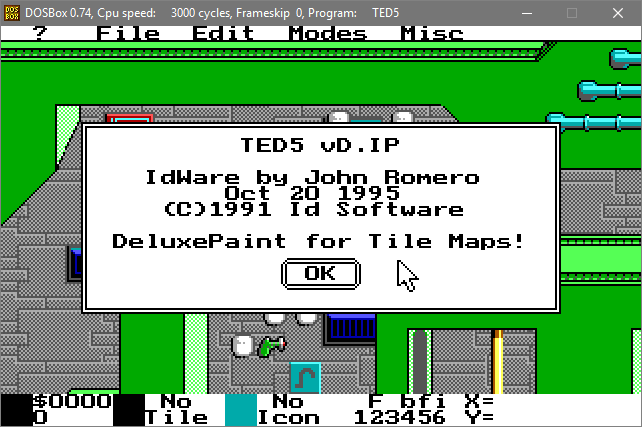 DOS with one of the many programs available to do this. the next lowest multiple of 8. Change to meet your needs. 0118-011AASM(ASCII values) Default file extension. 011D-011FBAC(ASCII values) Backup file extension - not in AECONFIG. 0122-0124$$$(ASCII values) Temp file extension - not in AECONFIG. screen line after the invocation line has the desired screen attribute. the rest of the screen is B&W. Which means AE inherits the B&W attribute. (3) If enabled, this feature also turns off insert on line delete as well. *will* require a '386 or better. "I don't do segments." portion of the file you're editing. Would be nice, but probably won't happen. The program is too hard structured for that to be an easy task. Doubtless, as I and others use the program, other enhancements will be needed. the necessary coding is beyond the scope of the project. Mouse support: Mice are great for CAD programs, draw/paint programs, etc. program. I am willing to listen to suggestions on how to "improve" this. However, as I am a color refusenik, I'm not going to go overboard on this. issue to me, I don't believe in long labels (or non-standard TAB stops). the user codes in a similar manner to the guy who wrote it. encountered that doesn't rigidly enforce this. Alm. Clarence Dyson, Bob Shepard, and Robert Cabral were also very helpful. The "home" BBS for AE.COM is the Hacker Heaven BBS at (408) 375-5455. We currently support baud rates from 300 to 14.4K+v.42bis. tolerate illegal activities of any kind. AE: Asm Edit. A source code editor for assembly language programmers. (at last!) Supports auto-colons on labels, auto-comments, much, much more. source code. A must for any serious assembly language programmer. * is the version number. UNLD8616.ZIP was the latest at this writing. are severely downrev, and should be deleted. version number. BAUDASC1.ZIP was the latest at this writing. at all times. Much smaller than other programs of its type. Includes source. was the latest at this writing. HELLO: [for CP/M *and* MS-DOS]. Writes the string Hello. to the screen. CP/M and MS-DOS!! Distributed as HELLO.ARK and HELLO.ZIP. Includes source. 8080 or 8085 processor. NO dedicated memory locations, ROMable routine. CAPS: Old timers like me are used to command line input in UPPER case. the end. Fixed the old MAC/ASM :000000 (incorrect) EOF record. hex or decimal. Included source. DELETE THEM ASAP!! These are obsolete and no-longer of value. Spitfire function. Only worked with a very old versions of Spitfire. program. Plus it won't work above 9600 baud. Don't use this program!!! A replacement is possibly in the works, either from myself or from Spitfire. MSGUNDEL: Or something like that, I no-longer remember the exact name. longer needed as Spitfire now allows the Sysop to turn off message deletion.